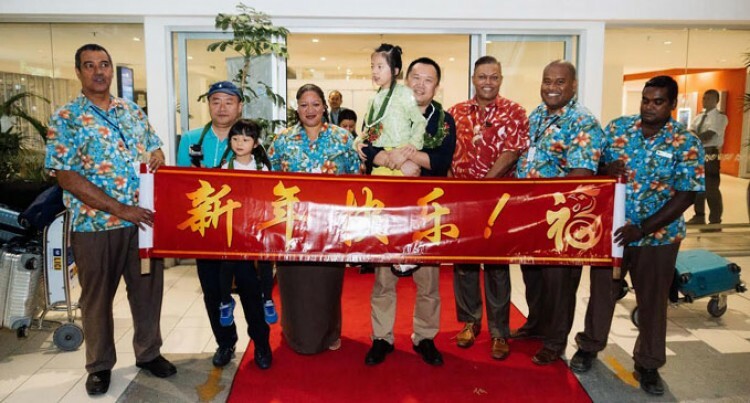 This is the third year the Rosie Group has used charters to move groups of Chinese tourists to Fiji for a vacation that coincides with the Chinese New Year celebrations. Chinese tourists greeted at the airport. For Chinese tourists, Fiji has a great attraction this time of the year as Fiji is the first country in the world to enter the New Year. And they can fill social media with their celebrations hours before anyone in mainland China gets to enjoy this very important time. As they did last year, Rosie will bring in 900 tourists in three separate arrivals over two weeks, two from mainland China and one from Taiwan. The Taiwan charter is operated by Rosies partner Ez Travel. Rosie is, as always, innovative and there is a difference in the composition of tourists from China this time around. In the past the source markets were Beijing and Shanghai, large and developed cities with large populations, even by China standards. But for this New Year Rosie decided to use a second tier source market and they chose Hangzhou, the capital of Zhejihang Province. It is classified as a sub-provincial city and is the core of the Hangzhou metropolitan area (the fourth largest metropolitan area in China) and the most populous city in East China. It has a population of over twenty-one million people and has been growing rapidly since 2000. It covers an area of thirty-four thousand square kilometres. It is a highly industrialised city with a wide range of industries and is home to the largest e-marketing operator in the world, Alibaba. The area’s GDP is RMB one trillion and the per capita income is just over USD18,000. It is home to a great number of very wealthy middle class people that like to travel. As one indicator of the affluence of the population of second tier cities, the Wall Street Journal reported that over fifty-four per cent of all imported USA luxury goods are sold in these second-tier cities. This shows not only the financial ability to spend on lifestyle, but the inclination to do so. “This year, we will be mounting a service into a second-tier city. In the past two years, we have operated charters into first-tier cities of Beijing and Shanghai. Hangzhou has a large international airport that serves the whole Yangtze valley for both domestic and international services and is a hub for Air China, China Southern Airlines and China Eastern Airlines as well as providing a huge cargo port. Its size can be assessed by the fact that it has over thirty air bridges in operation. The decision to use Hangzhou over Shanghai will be an interesting experiment, as these major city airports continue to fight congestion and poor on-time departures. The decision was based on a number of very important marketing considerations, which were discussed at length with Fiji Airways marketing people prior to a commitment. Fiji Airways have been the charter partner for Rosie ever since the first Chinese New Year charters started. Hangzhou is one of a large number of similar second tier cities in China and can reliably be used as a test market with learnings able to be applied elsewhere. While it is a second tier market it has a huge population of potential tourists. Its population is close to that of the whole of Australia and four times that of New Zealand, to the sort of loads Rosie requires are reasonably expected. Most of Fiji’s competition like the Maldives, Indonesia and Tahiti concentrate their marketing in the big cities. Marketing in second-tier cities where our competitors are less active means potential Chinese visitors can “hear the Fiji message of Happiness” clearer without all the “Marketing noise” deployed in these big cities. The smaller airports also make for a much better experience for the passenger, with less hassle and less chance for operating delays. Matthew Stoeckel, CEO of Tourism Fiji. “Visitor arrivals figures just released by the Bureau of Statistics for 2016 show that close to 50,000 Chinese tourists visited Fiji this year. China is our fourth largest source market and is expected to continue to grow in 2017 on the back of increased marketing and promotions in the region. Rosie’s investment in this vast and emerging market through the charter flights contributes significantly to this success in the market and importantly aligns with Tourism Fiji’s strategy to drive visitor arrivals in our low season”. Fiji Airways has adopted a similar strategy in Australia by introducing direct flights to Adelaide. Also taking advantage of the very affluent market there and the fact that almost all the competing destinations are not represented. Fiji Airways has been actively involved with Rosie in the development of the Hangzhou project. The Managing Director and CEO Mr Andre Viljoen said: “We welcome this opportunity to partner with Rosie again. “And this time fly into Hangzhou airport in mainland China, as it is very much in keeping with a worldwide trend in aviation. “This is where airlines are also experimenting with these less congested airports to fly into, where there is still a big market the size of countries. Spearheading the charter negotiations and logistics is Rosie’s General Manager Eroni Puamau, and assisted by Rosie’s sales offices in Shanghai, Beijing and Guangzhou as well as Rosie’s key tour wholesale partners in China. “Hangzhou is one of the fastest growing cities in mainland China, very affluent and conveniently located just under one hour travel in China’s famous electronic bullet train from Shanghai,” said Mr Puamau. The first Hangzhou flight has arrived with a full load of tourists, proving that the strategy of direct flights to second tier cities in China can work, and provide a good option for further expansion in the China market. The advantages these markets offer for the smaller destinations and the cost and operational economies available could make it possible to increase market share in China with reduced risk. And the Hangzhou project is yet another innovative marketing exercise that will assist Rosie to continue to be the market leader for Fiji in China.